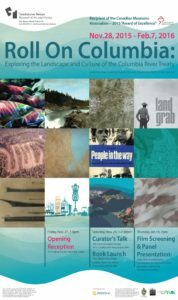 Roll On Columbia: The Landscape and Culture of the Columbia River Treaty explores the legacy of the Columbia River Treaty in order to inform present day understanding of the trans-boundary Columbia River watershed ecosystem. Roll On Columbia takes its name from the Woody Guthrie folk song of the same name, date from the era of the Great Depression when mega projects such as dams were celebrated and embraced. Nearly a century later, there is widespread understanding that mega projects transformed human culture’s relationship to water and the ecology of rivers, and not necessarily for the better. Yet, the rivers of southeastern B.C. continue to roll on through the mountains and across the international boundary into the United States, governed by the 50 year old Columbia River Treaty (CRT). The exhibition contains historical information panels as well at artwork by Heather MacAskill (BC) and Mary Babcock (Hawaii). It is guest curated by Eileen Delehanty Pearkes. View the exhibition and ask yourself – do the public values that originally formed the treaty remain the same today? A dress covered in spoons, a garment composed only of sleeves, an arc of lampshades….in the Poetry of Objects, artist Leah Weinstein invites you to celebrate unexpected connections and discover the extraordinary in the everyday. 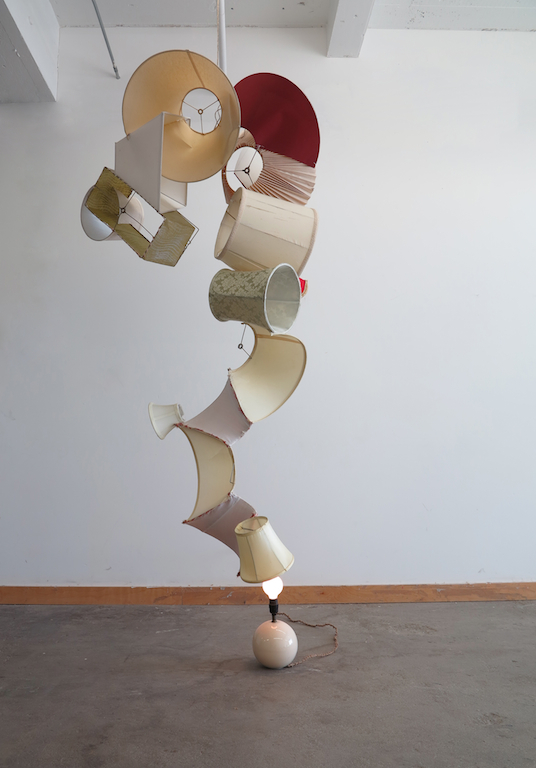 Using new and re-purposed materials and forms, Weinstein creates assemblages that use the familiar in surprising ways, blurring the lines between the ordinary and the profound. 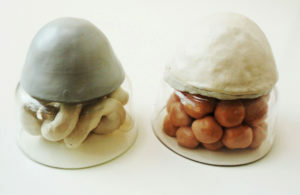 Leah Weinstein is a Vancouver‐based artist working in sculpture, textiles and performance. Between completing her BFA and starting her MAA (both at Emily Carr), in 2006-7 she studied textile design at the Kootenay School of the Arts in Nelson. 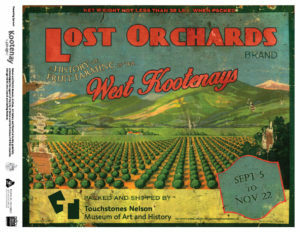 I have never seen anything finer than the fruit of the Kootenay District. You have a fruit country unsurpassed by anything in the Dominion – Professor Mills of Guelph Agricultural College, from early promotional literature. Fruit ranching in the West Kootenays? Unlikely though it may seem, fruit ranching once played a prominent role in the local economy. In the early 1900s large areas of land were being cleared and cultivated by newly arrived residents, often lured by the promise of a mild climate and easy growing conditions. Many orchards grew and thrived in the decades that followed, but by the 1940s only a few remained. Today, long neglected fruit trees in overgrown fields are almost all that remain of a once thriving industry. Come and discover the promise and hope, the endurance and despair of this nearly forgotten chapter in our local history. Living in the tension between beauty and repulsion, playfulness and danger, Pendulum/Pendula is a series of paintings produced collaboratively by artists John Hall and Alexandra Haeseker. With colourful subject matter drawn largely from Mexican culture, the work is rendered in the stunningly photorealistic style they’re both known for. Hall & Haeseker met when they were students at the Alberta College of Art and Design in the 1960’s. During their years of collaboration in the early 1990’s, they spent half of the year in Calgary and half the year in Guanajuato, Mexico. This influence can be seen in their use of objects from both traditional Mexican culture and modern consumer culture. Heaseker lives in Calgary and Hall now calls Kelowna home. Katherine Hofmann’s installation Domiciled combines clay with found materials in ways that confound, surprise and delight. In 2013 Hofmann made a clean break from her practice as a production potter in order to explore form and material in an open ended way. The resulting body of work is both playful and unsettling in it’s refusal to be conform to typical notions beauty and craftsmanship. Her raw, ambiguous sculptural forms are process driven and loosely reflect the body, plant growth and architecture. Did you know that in 1949 all bikes in Nelson required a license? Or that J. A. Gilker, opened his first store in a wall tent, and before becoming the first official postmaster used a wooden gin box set on its side to sort the letters in? 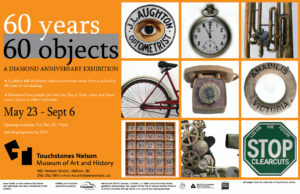 In celebration of 60th anniversary of the founding of our organization, this exhibition will share 60 notable or unusual objects from our Archives and Collections that help tell the story of our community. From a pickle jar to a bike license, this will be a diverse and rollicking exhibit that has something for everyone. What do international drug cartels and sun-soaked vacations have in common? In a new exhibition of work at Touchstones Nelson, artist Boukje Elzinga explores these connections and more. 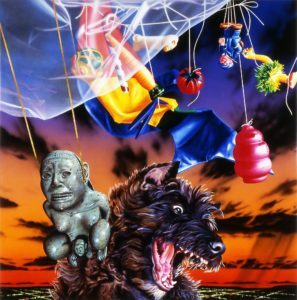 Titled “La Puerta Negra” (The Black Door), the work was inspired by numerous trips the artist has taken to Mexico, as well as a recent trip to Peru. The paintings and sketches relate not only to the richness of the culture, but also to the element of oppressive violence that reaches at least as far back as the Spanish Conquistadors and continues with the present day cartels. 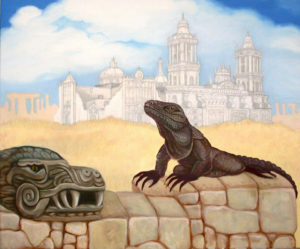 As an added attraction, Elzinga will occasionally be spending time painting in the gallery during the exhibition. For those so inclined, she welcomes the chance to talk about art, travelling, cartels, or any other subject related to the show. Work that she creates during this time will be added to the show in display cases adjacent to the gallery space. 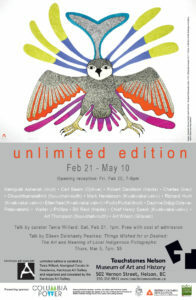 unlimited edition is organized by the Kamloops Art Gallery, Kamloops, B.C. Curated by Tania Willard (Secwepemc), Aboriginal Curator in Residence, Kamloops Art Gallery.